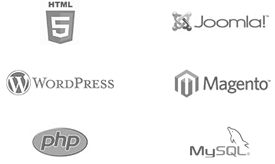 With some of the brightest minds at our disposal, your website can be customized from something as simple as a page of plain text to the most complex website with the most latest features and incorporating the most latest technologies – and you do not need an army of coders and website development gurus to build that out for you. We at Cactimedia have the team, the tools, the techniques and the vision to develop an insanely great website within your defined timelines and budget. Perfect text, images, tables, links etc. Build forums, create fresh content and optimize your site for higher conversions. Build a blog to voice your thoughts, ideas and opinions. Add pizzazz to your website with video, audio and other cutting edge functionality.